Josh learning to smoke food on Gas Grill. Note the 4 Foil “Hobo Pouches” in back. She put me in touch with her husband, who we will call Josh, by email. He informed me that he planned to invite “a few friends” over after our Lesson, to try out his food from the new Grill. No Pressure. We agreed that he would get most of the meats in advance, so we could do an abbreviated shopping trip before getting started. 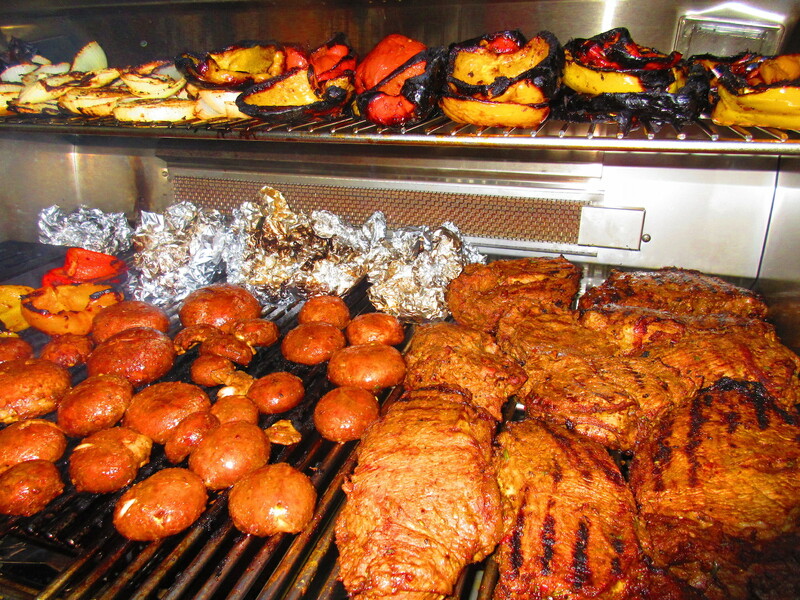 We did Recipes for Grilled Vegetables, Shrimp, Steak and Chicken Breasts. In this first part we here are Techniques for Smoking. Josh got to “Double Down”, by learning techniques for Smoking Food on the new Gas Grill, as well as on his favorite Ceramic Egg Grill that he uses all of the time. First we went to the local BBQ Supplies Store and picked up bags of Wood Chips and Chunks in both Hickory and Mesquite varieties. 5. For longer cooking sessions, replace Chunks every 1-2 Hours, if Smoke fades. 3. Created “Hobo Pouches” by wrapping 1/4 Cup of Dry Chips into Aluminum Foil sheet, squeeze sides together to form punch leaving top open to allow smoke to escape. 5. If Pouches smoke too high, move to spots with less heat. If smoke dissipates, add more pouches for continued Smoking. Also look for Recipes for Grilled Vegetables, Shrimp, Steak and Chicken Breasts from this Session. Indirect Smoking (octopus) on a Charcoal Grill. Note Soaked Wood Chips are added after Coals are ready.